Two centuries ago the Age of Madness ended in the event known as the Shrug. Gaia's outrage raised the sea and changed the weather, and society crumbled. The Druid Order came forth to lead us in a new way, inspired by the ideas of ancient times. Now the seven kingdoms know peace and prosperity, but rumours and shadows are growing. Who will confront them? 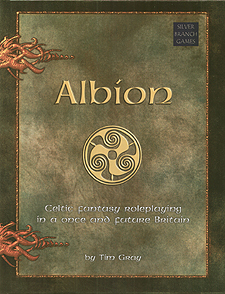 Albion is a fantasy roleplaying game using Celtic elements and themes in an isolated future Britain that has turned back to its past. Magic lies below the surface and can be stirred by any skill or roused by spells, and the paths of destiny call for champions. The basic rules are simple, with plenty of options for adding more detail to characters when you're ready.